What if your driver pulls up to a store with a cooler delivery, but it is broken? Of course the delivery would be refused until after the cooler is fixed. 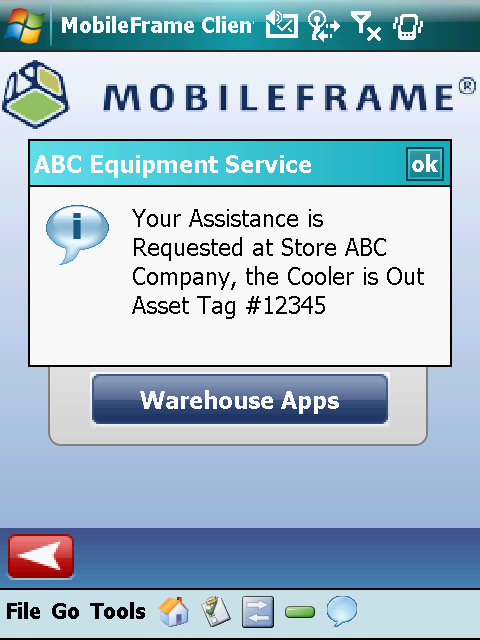 With MobileFrame’s software, a real-time alert can be sent to dispatch, while at the same time a work order is automatically created and sent to the field services department. The repair tech is then dispatched to repair the cooler, and upon completion of the repair the original delivery is re-scheduled for the driver. Once the delivery is complete and the digital signature is captured, the invoice is generated and the back office is updated. All of these events were triggered simply by the unexpected situation of the broken cooler and was managed via embedded logic of each action-based event. Real-time alerts can keep your organization running like a well oiled machine, eliminating communication errors and decreasing turnaround time for each process. In the end you’ll not only increase the efficiencies of your team, but you’ll also end up with more satisfied customers. Contact us to see the solution in action and learn how it can be customized to your requirements, all with no programming required.